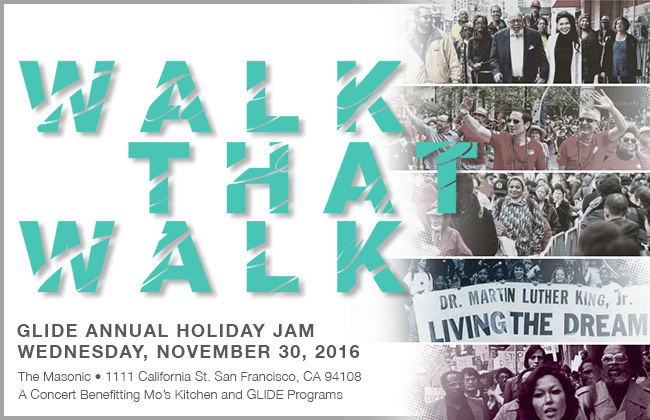 GLIDE’s Annual Holiday Jam: Walk That Walk comes to The Masonic, 1111 California Street in San Francisco on Wednesday, November 30 to honor GLIDE co-founders Janice Mirikitani and Reverend Cecil Williams and raise funds for Mo’s Kitchen (home to GLIDE’s Daily Free Meals program) and the organization’s other services. The spirited evening will include an all-star lineup of performances by musician/filmmaker/humanitarian Michael Franti–long known for his globally conscious lyrics, powerful performances, and dynamic live shows; drummer/percussionist Sheila E, R&B artist Goapele, jazz and cabaret singer Paula West, The Doobie Brothers’ founder/lead singer Tom Johnston and bassist John Cowan joined by vocalist Lara Johnston, Urban Jazz Dance Company’s Antoine Hunter, a special performance from The San Francisco Gay Men’s Chorus, the world-renowned GLIDE Ensemble and The Change Band, along with Mistress of Ceremonies Renel Brooks-Moon. Food and drink will be provided by some of the Bay Area’s finest restaurants and beverage companies. Honorary co-chairs include Pam and Larry Baer, Richard C. Blum and Senator Dianne Feinstein, The Honorable Willie L. Brown, Jr., Amy J. Errett and Clare E. Albanese, and Felicia and Ben Horowitz. A phrase that Reverend Cecil Williams coined in the mid-1960s, “Walk That Walk” means to inspire people to take action—not just talk—in seeking justice and unconditional love for all those who are struggling with hunger, homelessness and disenfranchisement. This year’s event will also celebrate and reflect on the more than fifty years of extraordinary leadership and visionary activism that Williams and Mirikitani have dedicated to GLIDE. For over 50 years, they have spoken out against hate, exploitation, violence and dehumanization. “On the occasion of this year’s Holiday Jam, we encourage people to walk that walk and talk that talk, to love and serve the most vulnerable among us,” said Rev. Williams. “By walking that walk and fighting for justice and equality for all, we can inspire the change within ourselves and do extraordinary things together,” said Mirikitani. Each year, the GLIDE Annual Holiday Jam raises funds for GLIDE services, including the Daily Free Meals program. Located at GLIDE’s Tenderloin headquarters, Mo’s Kitchen serves three meals a day, seven days a week, to San Francisco’s most in-need individuals and families, totaling roughly 750,000 meals annually. Doors open for the Holiday Jam at 5:30 pm for the 7:00 pm program, followed by a post-performance reception until 10:00 pm. Individual tickets are available now through glide.org. Individual tickets range from $65 to $250; VIP tickets and sponsorships are available now and range from $500 to $500,000. For more information, please visit glide.org, call 415.674.6060 or email festival [at] glide.org. For more than fifty years, GLIDE has worked to create a radically inclusive, just and loving community mobilized to alleviate suffering and break the cycles of poverty and marginalization. Located in the culturally rich Tenderloin neighborhood of San Francisco, GLIDE serves a diverse cross-section of homeless, low-income and disenfranchised program participants, providing a comprehensive set of programs including: free meals; HIV/Hep C testing and counseling; housing assistance; domestic violence counseling and abatement; substance use recovery; licensed childcare; afterschool and summer programs for youth; a resource center for families; free legal services; and access to free primary and behavioral health care. GLIDE has founded and sustained visionary programming and achieved tangible results for tens of thousands of individuals and families on the margins, and remains a life-changing gateway to comprehensive care that embraces each person with dignity and respect. Individual tickets range from $65 to $250 and are available through glide.org. VIP tickets and sponsorships range from $500 to $500,000 and are available now by calling 415.674.6060 or emailing festival [at] glide.org.